I’d be lying if I said the wedding invitations were fun or easy to do. Back in April my mom came down for a visit to help with some wedding stuff. The big thing was getting the invitations made. My friend Star got a discount at FedEx/Kinko’s so we took in the digital file to get the invites made. I’ll be honest, I seriously thought it would just be handing them the flashdrive, telling them the color paper we wanted and then picking them up. It was so much more involved than that and not very fun. Also, they didn’t really follow my instructions when I dropped it off so I went back several times to look at new proofs before we FINALLY got the invitations the way we wanted them. The story isn’t very interesting, it was mostly frustrating, then I discovered that it’s apparently impossible to find envelopes as well. This was not my favorite part of wedding planning. We are going with a fall theme, obviously. 😉 The wedding colors are burnt orange, dark red, dark purple. The bridesmaid dresses (which I got back in September last year) are a dark plum. My dress is champagne colored. I invited the bridesmaids over to help address, stamp, stuff and label the invitations. I decided we should do a brunch/lunch event at my place instead of dinner. It seemed to work better for everyone’s schedule and I got to plan a fun lunch menu! I wanted to do a canape/finger food menu with lots of fresh fruit and refreshing beverages. This first recipe was my favorite! The herb cream cheese spread was so flavorful. I loved the garlic, green onion and dill together. I don’t think that it necessarily needed the avocado. I don’t know that the avocado added anything special to what was already really good. This is sometthing I’d make again for parties. 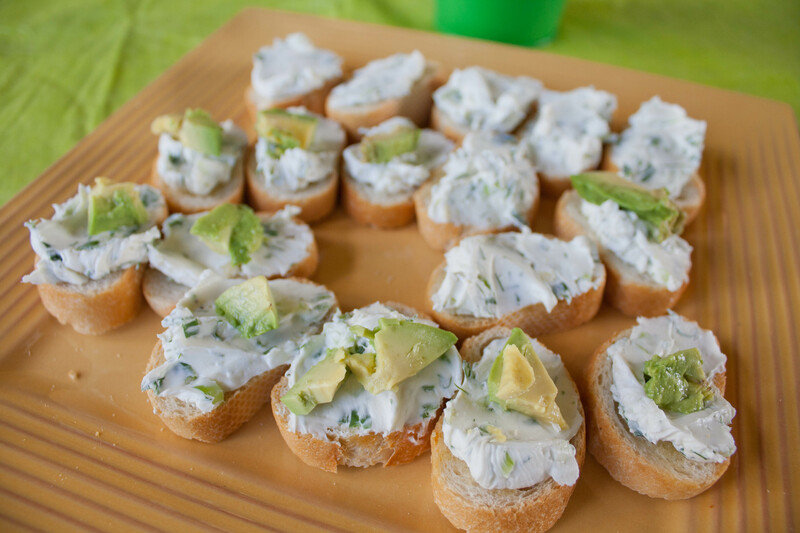 Here is the recipe: Canapes with Garlic Herb Cream Cheese and Avocado. The next one was the Feta & Cucumber Bites. 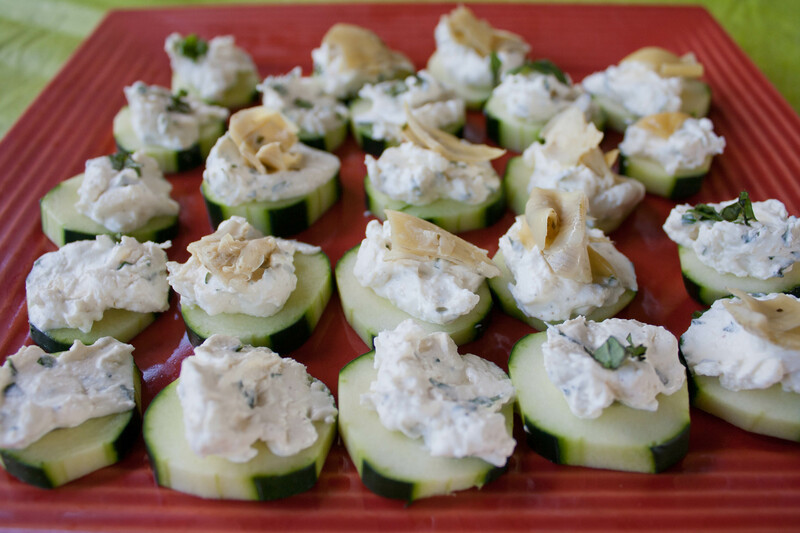 I liked using the cucumber slices instead of crackers or a baguette. It was refreshing and delicious. I forgot to buy sun-dried tomatoes so I improvised with some marinated artichoke hearts. I thought it was pretty good but I’d probably try it with the sun-dried tomatoes next time. It needed a little “salty” something. The Tortellini Broccoli Salad was the “main dish.” I loved the combination of the tortellini and the broccoli. 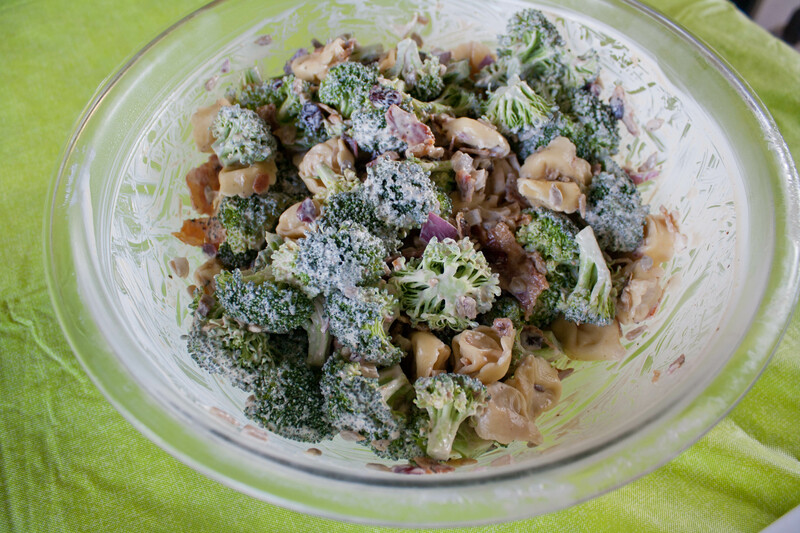 I’ve made a similar broccoli salad in the past and I think I like this version the best. 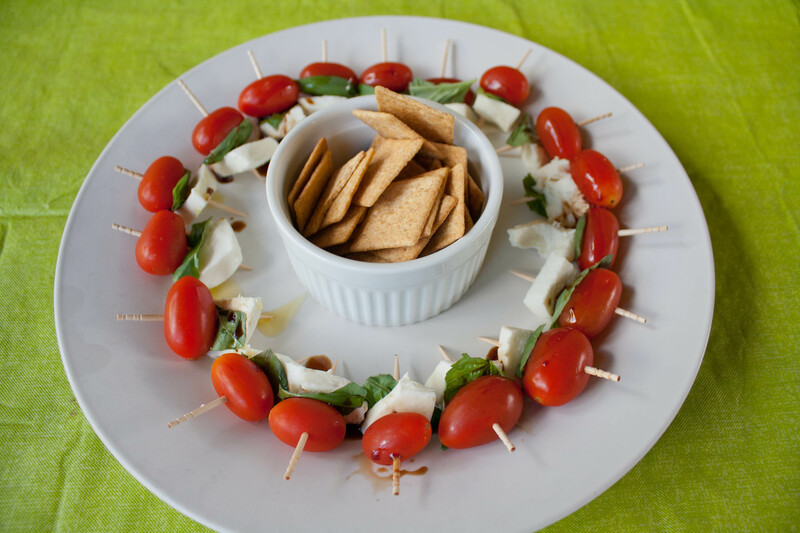 I also did a small plate of Caprese bites–basically it’s cherry or grape tomatoes with fresh basil, mozzarella cheese and drizzle and little balsamic and olive oil on it and you’re good to go. It’s a good summer time snack. 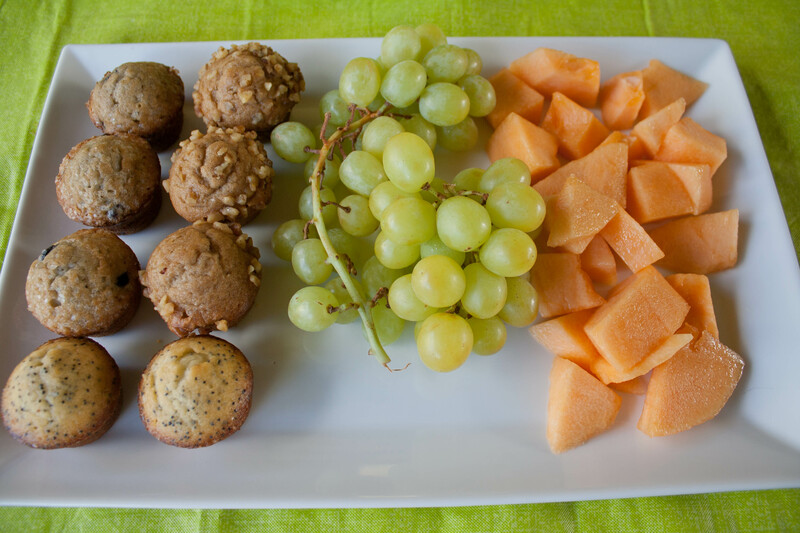 Lastly, I put together a mini muffin and fruit plate as kind of the dessert. We had raspberry lemonade (some had theirs spiked :D) and then Anna and I both had a Bloody Mary. Yum! We sat outside on the deck and ate lunch and chatted for awhile, catching up and just enjoying the sunshine. Then we cleaned everything up and got started on the invitations. Bella ran around outside in the yard while we worked. With 6 of us working on them it only took about an hour and a half. I so appreciated the help! If I had to do them all myself it would take forever! Three of us worked on addressing the envelopes, two of the bridesmaids worked on labeling and stamping the RSVP envelopes and one worked on stamping the envelopes. We got a pretty good system down and it wasn’t too bad. It was a big relief to have one more thing to cross off the to-do list, and it was a big thing! 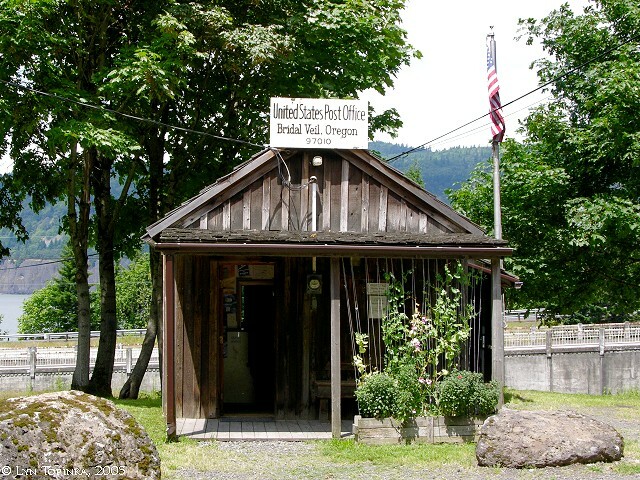 There’s a post office in the Gorge in a small town called Bridal Veil that a lot of brides mail their invitations from just to get the postmark that says “Bridal Veil.” I kind of dismissed the idea but then when we were doing the invitations I thought it might be cute for the postmark to say Bridal Veil…I went online to see what their hours were and apparently it was a super complicated process and you weren’t allowed to bring pre-stamped envelopes to mail there, you are supposed to buy the stamps from their post office (and pre-ordered with a check, mind you). So that was a super bummer. I guess our invitations will just have to say “PORTLAND”! Since I won’t be making the drive out there to mail the invitations I guess they are going out a little sooner! My husband and I basically eloped – well, my Mom and his parents were there and our my daughter was the maid of honor and my step-son was the best man – never had to deal with details of a wedding, because that isn’t me, but that isn’t to say I don’t enjoy reading about other weddings that people love to plan! I absolutely love your invitations! I would love to pick your brain on wedding stuff in the near future. The thought of planning such a large event is overwhelming to say the least. It was a lot of fun to do it as a group. 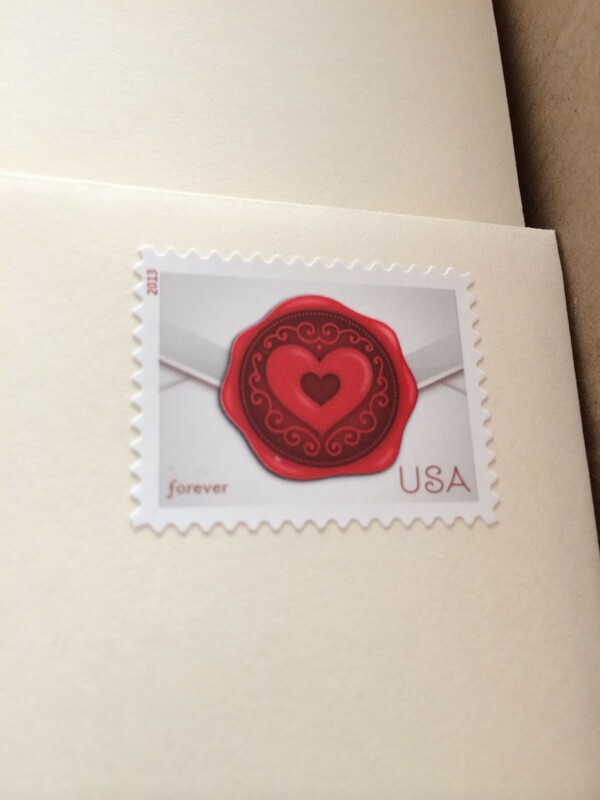 90% of your guests would never have even noticed the postmark so you made the right choice. That’s one of those niceties that brides get all crazy over that actually has very little pay off. Better off skipped. Yeah I didn’t think the postmark was a big deal. Pretty invites! That was one thing I didn’t care about. We ordered a bunch with matching RSVP cards off Vistaprint in green (our colour) and we were good to go. Because we only invited 50 people the invites took me an hour in front of the TV one night. My maid of honor lives in London (I’m in NZ), and my bridesmaid lives an hours flight away so I was completly on my own for everything wedding until a few days before. The front of your invitations is beautiful! I made my own, but mine were just print on a card with vellum covering it and held to the card with a ribbon. Fortunately there weren’t too many to make (there were only 50 people at the wedding), but it was more work than I anticipated. Sounds like it was a productive day with girl friends! Deb recently posted..Sunday Day TEN WEIGH IN! Oh my god, that sounds frustrating!! I’m sorry! 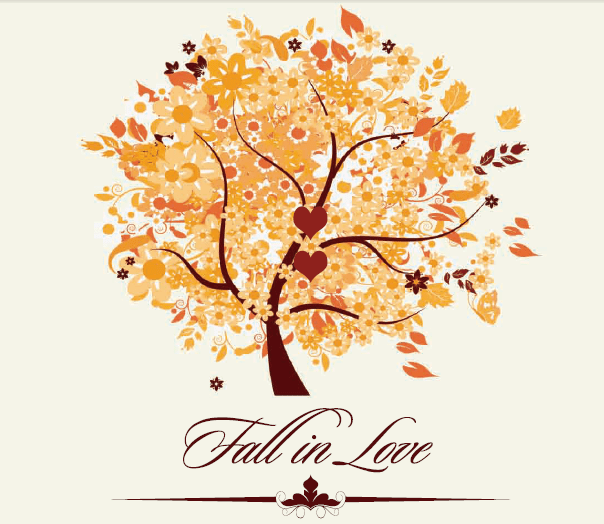 I love your invite and the fall theme!! Such a fun way to tackle a big project! All of your food looks super tasty!